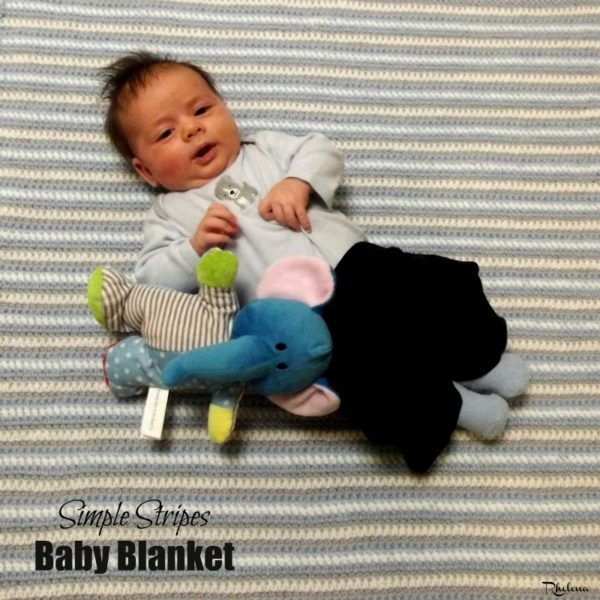 If you’re looking for something easy, yet cozy, then this simply stripes baby blanket is just what you need. Although a bit time consuming, it’s a mindless pattern once you get going on it. This crochet baby blanket is crocheted in a nice solid stitch using a worsted weight yarn. It’s great for covering the little ones up while sleeping, or for playing on the floor as you see pictured. For this blanket, I chose a grey, blue and white color combination for a little boy. But for a girl you could substitute a light pink for the blue and have it look just as pretty as this one. 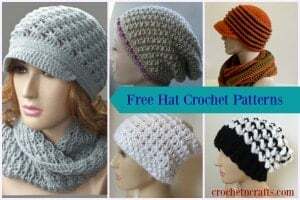 And since there is no stitch pattern, you can crochet this to any size you want; one for baby and one for yourself! Other baby blanket patterns that you might enjoy are the seed stitch baby blanket, the blossom baby blanket, or this quick and easy chunky broomstick lace baby blanket. Change to new color at last yarn over of last stitch in each row. Fasten Off CA and CC after each row. Carry CB up at each row. Row 3: With CA, rep row 2. Row 4: With CC, rep row 2. Row 5: With CB, rep row 2. Row 6: With CC, rep row 2. Row 7: With CA, rep row 2. Row 8: With CB, rep row 2. Row 9: With CA, rep row 2. Rows 10-93: Rep Rows 4-9 until you have reached a desired length. With CC, Ch 1, esc evenly around working 3 esc in each corner. Fasten Off. And be sure to check out the collection of crochet baby blankets on CPB.